Please join me, Spec’s fine wine buyer Bear Dalton, at the Wine School at l’Alliance Française for Revealing Rosé at 7pm on Monday, June 27th at l’Alliance Française. Why Rosé? And why now? Because there is no better and more refreshing wine to drink this time of year. And our Texas Rosé drinking season is up and running. Topics of discussion will include vintages, types of Rosé, Rosé and food, and the grape varieties and techniques used to make the wines. Sixteen pink wines (all French) will be tasted and bread and a selection of fine cheeses will be served. Dress cool and join us for delicious and refreshing Rosé. Revealing Rosé will cost $40.00 per person cash ($42.11 regular). To reserve your spot, please contact Susan at 713-854-7855 or coburnsusan2@gmail.com. We Were Ready For a (SANGRIA) THROWDOWN! 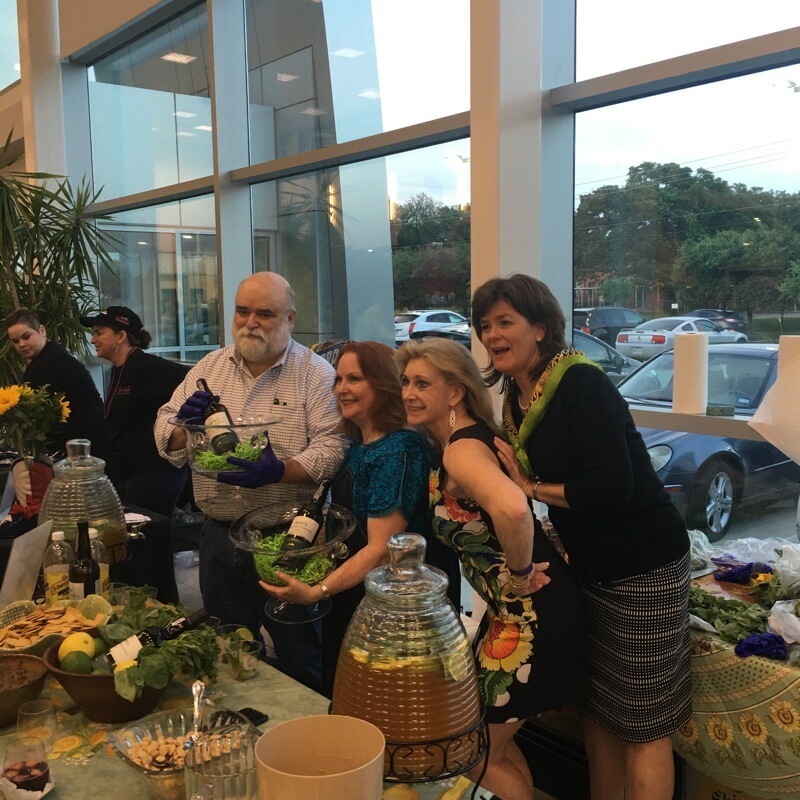 On the evening of Monday, June 13th, I participated in the Women of Wine’s 6th Annual Sangria Throwdown held at Tommy Vaughn Ford in Houston. The Women of Wine (WOW) is an organization of women, many of whom work with wine professionally, who raise money for and awareness of the Houston Area Women’s Center. The “Sangria Throwdown” is WOW’s annual Sangria competition and fundraiser held in June each year. This year, there were eleven teams competing for three awards: Judges’ Choice, people’s Choice, and Most Creative. While I helped get WOW started and try to support them as much and as often as I can, I had not participated in any of the previous Sangria Throwdowns. This year, however, I was inspired by some good natured needling from three time winner (and now throwdown judge) Sean Beck. So I decided that if I was going to participate, I had to try to win and to do that, I needed a great and unique and even different Sangria recipe. So I started to work on that recipe. I didn’t want to make a sweet red Sangria, partly because Wanted a drink my wife Carol would enjoy and she is adamant in her dislike for sweet red Sangria. So began to riff off of two ideas: a white Port cocktail called a Port Tonic and the on-going Spanish craze for heavily garnished Gin & Tonics. A Port Tonic is white Port and Tonic with lime so the two essentials of Sangria – wine and fruit juice – are already there. However, while a port tonic is perfectly fine and refreshing cocktail, more was needed. So, as Gin is neutral spirit infused with botanicals, I decided to try infusing my white Port of choice (Dow’s White Port) with two of my favorite herbs: Basil and Cilantro. I encounter Basil and Cilantro individually all over the place but I think I first encountered them together in a Vietnamese restaurant. I like the two flavors together so I began using them in together in a tomato salad I make as well as in a cantaloupe and mango salad. As I began to experiment with basil and cilantro in white Port, I felt I was on to something. over the summer and fall of 2015, the drink – Green Sangria – came together. Over the winter, I began thinking about presentation. I wanted a colorful presentation that highlights the flavors found in the drink so our garnish included a sprig of cilantro, a basil leaf, some frozen red and green grapes, some lightly salted frozen cantaloupe, and a half wheel of lime. all served cold with just a few ice cubes. After several trial runs on various friends and family (all sworn to secrecy by head grape de-stemmer and glass garnisher Carol) including a full dress rehearsal with full garnish the Wednesday before the event. We felt like we were ready for the show. 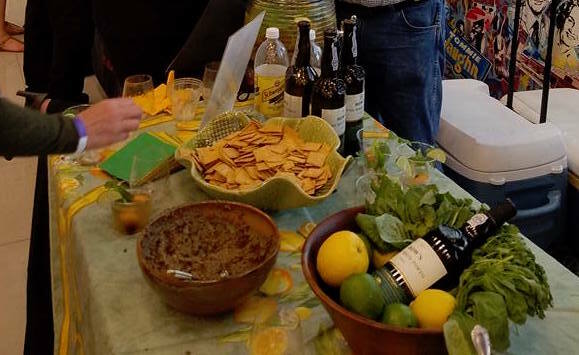 As we got ready for the event, we realized that were most likely serving the driest (least sweet) drink in the room so we decided to put out a bowl of Marcona almonds and a bowl of green and black olive tapenade so people could reset their palates after tasting other sweeter Sangrias. I guess everything worked because when the votes were tallied, WOW President Denise Ehrlich announced that team Green Sangria had won the Judges’ Choice award, come in third in Most Creative, and won the People’s Choice award. Special Thanks to Miss Carol for all her work and perseverance and support over the development of the recipe and to Deborah Touchy and Joan Sokol for their help and support the night of the event. Add two 750ml bottles of Dow’s White Port. Allow to macerate in the refrigerator for at least 6 hours stirring occasionally (over 12 hours is better). Strain this mixture through a sieve or a chinois. Over frozen grapes and cantaloupe and a few ice cubes and garnish with a sprig of cilantro, a basil leaf, and a half wheel of lime. For the first time, I will be participating in Women of Wine’s Sangria Throwdown. I am in-it-to-win-it so please come out to Tommy Vaughn Ford next Monday (6/13/16) at 6:30pm and try my unique Green Sangria along with ten other creative Sangrias. It will be fun and you will be supporting a great cause: The Houston Area Women’s Center. Please click http://www.wowcharities.org/events-happy-hours/2016-sangria-throwdown/ to buy your tickets.